Psychotherapy at the Connecticut Center is grounded in Existentialism and greatly influenced by Humanistic thought. (although neither used the term) and in the works of the 20th century philosophers Martin Buber, (“I and Thou”) Martin Heidegger (“Being and Time)” and Jean-Paul Sartre (“Being and Nothingness”), as well as in the writings of Albert Camus and Simone de Beauvoir. Their work made Existentialism a dominant 20th century philosophy and had a profound influence on the development of new forms of psychotherapy — in particular, Gestalt Therapy. The Philosophy centers on the exploration of the human condition. Existentialism presumes the human being as "thrown into" (Heidegger) a concrete, inveterate and random universe that ultimately is purposeless, implying there is no meaning at the core of human existence itself. It is Man himself who seeks to explain his existence and who assigns meaning to the world he finds himself in and to life itself. Existence cannot be "thought away,” and therefore existence ("being in the world") precedes consciousness, and as such is the ultimate reality. Based on that, Sartre formulated a core premise: “Existence precedes essence.” He concluded that because humans define their own essence, (meaning they choose their purposes and interpret the world they find themselves in) they must exist prior to doing so. In this context - considering that the whole is greater than the sum of its parts - essence is understood as the whole of the meanings and purposes man ascribes to life and the world he experiences himself in. This view implies that psyche, self and personhood evolve from one’s existence. Or, as Sartre put it: “Man is nothing else than what he makes of himself, such is the first principle of Existentialism”. The power of having the freedom of choice results in having to assume responsibility for one’s self and life. Freedom and responsibility are interdependent and presuppose each other. Sartre articulated it this way: “Man is condemned to be free; because once thrown into the world, he is responsible for everything he does". The individual person is viewed as a free and responsible agent shaping his own development through acts of will. Choices and decisions one makes are based on the assigned meanings and on what therefore has significance to one’s self. It’s not necessarily based on what a rational assessment would suggest. Existentialism embraces the bright as well as the dark side of human nature. It is part of the human condition for Man to contain contradictions and polarities. How one relates to those and the meaning one assigns to them forms and defines the Self of a person. The freedom to define one’s own self is on one side is both a fulfilling and exciting responsibility but yet on the other hand, that very same responsibility can sometimes become an overwhelming, terrible burden. 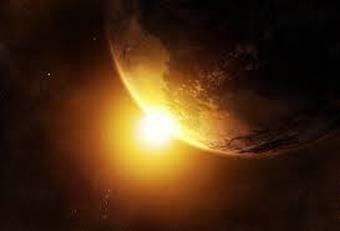 To be in the world is remarkable and not to be taken for granted, however that very existence is final, one has to face one’s mortality and death, causing one to experience what is called existential “angst”, a profound existential dread or anguish.Psychotherapy at the Connecticut Center is grounded in Existentialism and greatly influenced by Humanistic thought. The plight of the human being to exist in an unfathomable universe and to have to assume ultimate responsibility for acts of free will without any certain knowledge of what is right or wrong, good or bad, is described in depth and analyzed. Existential themes that derive from that perspective, such as dread, boredom, alienation, isolation, aloneness, freedom, commitment and nothingness and the absurdity of life are extensively examined. Assuming personal choice and responsibility, even if claiming one’s freedom causes anguish or dread, are the only way to transcend the essentially absurd condition of humanity, which is characterized by suffering and inevitable death. Existentialist philosophy appreciates the integrity of the person. Body and mind are seen as an integrated whole, embodying both reason and unreason. And “wholeness of Man involves the sphere of between” (Buber) - the “inter-human” community relationships - which is the ground for humans to define their Self , which is their essence. Man’s quest for authentic selfhood is investigated within that framework. The dehumanizing elements of the objectifying natural science model, reductionist explanatory theories and quantification are exposed and rejected. What matters is the person’s self-experience; anything else is a distraction at best and violence against the human at worst. Man is not an object for others to cathect, a collection of neurotransmitters and chromosomes, a repertoire of behaviors, or an information processing unit. The human being is an experiencer, an actor, a chooser — a whole and unique person in the world. 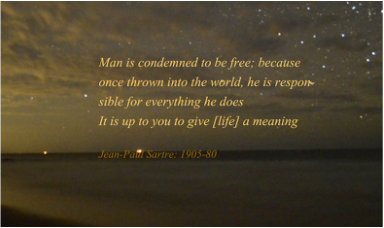 By articulating the importance of human dignity, integrity and freedom of choice, Existentialism is both affirmative and rebellious. 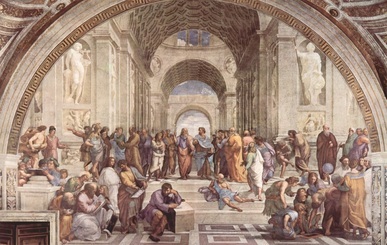 Humanism, rather than being a specific philosophical doctrine, is more a movement in philosophy born in the Renaissance towards a more human-centered (and less religion-centered) approach to life. It emphasizes an ultimate faith in humankind, and believes human beings possess the power of potentially solving their own problems, relying primarily upon reason and scientific method applied with courage and vision. Humanism is more a general life stance or attitude that upholds human reason, ethics and justice. It is a component of a variety of more specific philosophical systems. In the 1950s, grounded in that movement, Humanistic Psychology evolved, with values that were also shaped and informed by Existentialism. There are seemingly incompatible differences between these two philosophical approaches that appear to be impossible to integrate. But there are ways in which both philosophical veins are complementary and/or compensate each other. Humanist belief stresses the human potential and the conceivable goodness of human beings, emphasizing common human needs and the conviction that there are rational ways to solve human problems. It embraces a profound optimism about human nature, unlike the more balanced view offered by existentialism that emphasizes wholeness by shedding light on the dark side of human existence as well, including the examination of evil (“Evil is vitality in need of transformation”’ S. Kopp). While Existentialism focuses on the human as a creator, the one who formulates values, purposes and ultimately defines a Self, Humanistic Psychology places its emphasis on self-discovery. It presupposes an innate drive for self-actualization. The true self is assumed to be there, often in need of being explored, further formed and actualized. Thus Humanism’s optimistic attitude to life sees the ultimate goal in personal growth - to develop one’s Self - to live a fulfilled meaningful life. Essential to that process is the experience of each moment, to live in the Here and Now. In a complementing way, Existentialism goes deeper, seeing Man’s life as a tension between history and possibility, which is to say between past and the future. Thus the Here and Now, the present, is understood as the intersection of previous choices (now integrated into a self) and the process of projecting oneself forward at each moment – anticipating, dreading and planning. Humanistic Ethics affirm the equality, dignity and worth of all people and their ability to determine right and wrong by appealing to universal human capabilities, especially rationality, not unlike Kierkegaard’s emphasis on rationality as a means to overcome existential anxiety. Humanism acknowledges the human being’s potential for compassion, empathy and the need for tolerance and cooperation. Authoritarian beliefs are questioned and rejected. This perspective is shared by both Philosophies. In that way, Humanism and Existentialism are rebellious, affirmative and potentially even revolutionary at the same time. Humanism sees the person as an integrated whole of body, soul and mind and as such, capable of making her/his own decisions about life. In that sense, the human being is regarded as capable of experiencing his own autonomy. This not only is compatible with Existentialism’s focus on responsibility and freedom of choice. The two approaches also amplify and deepen each other’s view. Here the understanding of both approaches can be integrated and expand and deepen each other. Another commonality between the two is the outlook or system of thought that attaches prime importance to human rather than divine or supernatural matters. The complementary thoughts and insights, as well as the contradictions and seemingly incompatible aspects of Humanism and Existentialism and the tension that emerges from holding both points of view, are the fruitful ground for unique forms of psychotherapy to evolve. Body-centered therapy helps a client move toward authenticity and meaningful responsibility. It supports the client to explore and become aware of his real self and the meanings he assigned to himself and the world he lives in based on past (including childhood) experiences. Therapy enables the client to examine his existence and to develop a more meaningful approach to life. In the existentialistic/humanistic view, every person continually discovers and remakes themselves. Neither human nature is discovered once and forever, nor is defining and developing one’s essence finite. Just as life itself is an ever-changing progression of experiences, so is ascribing meanings and purposes an ongoing lifelong evolution. Within that process experiences and meanings influence and alter each other. Awareness of that process is the base for an authentic life. The existential issues explored in therapy are the internal conflicts that arise from the ongoing, inescapable confrontation with the givens of human existence–isolation, boredom, powerlessness, freedom of choice, responsibility, death and the desire for a meaningful existence. Human beings are seen as having a need to engage in something that gives their life significance and provides meaning. If this intent cannot be fulfilled, an existential vacuum, or void, is created and this may in turn cause an existential neurosis or depression. The humanistic stance contributes a nurturing and supportive approach to human development and the belief in the limitless possibilities for growth within each person with the emphasis on change, evolution and self-determination. Both frames of reference together form a more balanced and holistic perspective on the human condition and are the background of the holistic framework that the therapists at the Connecticut Center for Human Growth and Development work within. Therapists at the Connecticut Center are licensed and certified professionals, whose work supports and fosters optimal mental health and personal growth. Many years of learning, experience and insight are utilized toward the goal of integration of body, mind and spirit. The Center is grounded in the belief that knowing and being true to one’s self is the key to mental, physical and emotional health, as well as the key to true autonomy and responsible spontaneity. Their integrated approach includes Gestalt Therapy, Bioenergetic Analyses, Psychodrama, Object Relations and other treatment modalities as well as neurophysiological insights. In recent years scientific studies (particularly trauma research), have shown an increasing amount of evidence of the mind-body connection and how it works. Mind and body seem to be functionally identical. Thinking and feeling are neurophysiological (and thus physical) processes that interact with the body as a whole, just as the body in return impacts what and how one thinks and feels. Body structure and organization are the manifestation of the whole (the whole is greater than the sum of its parts) of a person’s emotional and mental life experience, particularly the early formative years. In that way, the body remembers implicitly one’s life experience. Many of the physical reaction patterns to stressful life situations formed during the formative years reflect implicit memories. The body remembers or “keeps score” as Van der Kolk put it. One example for the mind body connection would be someone who believes him/herself to be unlovable is likely to experience him/herself as worthless and may therefore feel hopeless about life and possibly develop a depression. This person is much more likely to become physically ill (develop heart disease, for example) than someone who is well-connected to other people and who feels loved and cared about by others. Likewise, someone who has had a heart attack is more likely to fall into a depression than a physically healthy person. In accordance with these observations, other medical and psychological studies show that people who enter therapy after they have had a heart attack increase their life expectancy significantly. The same seems to hold true for many other stress-influenced diseases. The Connecticut Center's approach to treatment considers these insights and, if appropriate, integrates Bioenergetic Analyses as well as other bodywork in the therapeutic process. that can be avoided is the pain that comes from trying to avoid pain.